Use the Actor, Film and Role tables to select these fields. Make sure you enable the Allow blank value option. 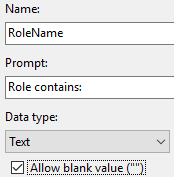 Add a filter to the dataset so that it returns roles which contain the text entered into the parameter. The Value expression should look like this: ="*" & Parameters!RoleName.Value & "*"
Repeat these steps to create two more parameters which will filter on the actor and film names. Try different combinations of names.